For most people, fall means pumpkins, Halloween, warm sweaters, and boots. Here in Indiana, fall means it is apple season! Whether you prefer to pick your own apples or browse through the beautiful orchards and leave with a bag full of already handpicked apples, here are the best apple orchards in Indiana that should be on your list this fall. Hainlen Orchard in northern Converse, Indiana, has been in business for almost 100 years. Family owned and operated, Hainlen Orchard has been providing residents in Indiana with some of the tastiest, fresh-picked apples every year since they opened. This is not a u-pick orchard, however, they do have a delicious selection to choose from inside the store. They also have some of the best, fresh made apple cider! As the seasons change, so do the products. As it gets closer to Halloween, be sure to visit and choose from hundreds of pumpkins, squash, and more! Farlows Orchard is another favorite among Indiana residents. Located in the small town of Russiaville just off Alto Road, Farlows Orchard has been family owned and operated for the last 130 years. They have a delicious selection of apple dumplings, and the best chilled apple cider. Keep an eye on their schedule, because during certain months, Farlows is a u-pick orchard! Another family owned and operated orchard that is a favorite among Hoosiers is Tuttle Orchards in Greenfield, Indiana. A fourth-generation family farm, Tuttle Orchards operates year-round and each season brings a different theme and a variety of activities and produce. They operate on country hospitality and each year, over 10,000 people visit the orchard to buy produce, learn how to make apple cider, and take part in the many activities that are offered. Radke Orchards in northern Michigan City, Indiana, has been family owned and operated since 1894. A u-pick orchard, visitors come from all around to pick the most delectable apples from the trees, fitting as many as they can into a container, bag, basket, etc. You can ask to have the container weighed before picking or wait until after you’ve picked to have it weighed. Ever thought about bringing your furry friend to an apple orchard? Here at Radke Orchards dogs are allowed, as long as they are well behaved, on a leash, and visitors pick up their waste. Beginning Labor Day weekend through Halloween, come to Phil’s U-Pick Apple Orchard in Huntington, Indiana, and get your pick of the freshest, most delicious and juiciest apples that Indiana has to offer. Choose from fresh Honeycrisp, Golden Delicious, McIntosh and so many more apples to choose from! Be sure to buy some apple cider before you leave! For a great apple picking experience, come to Pleasant View Orchard in Fairland, Indiana. For over 80 years, Pleasant View Orchard has been providing families with a fun apple picking environment and other delicious selections. Their apple butter is amazing as are their caramel apples. 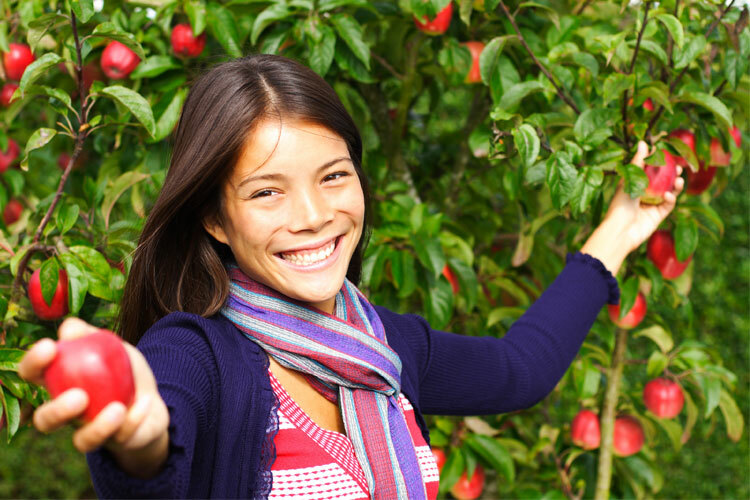 Whether you prefer Jonathon apples, McIntosh apples, Hawaii apples or a personal favorite, Red Delicious, there is an apple for every taste here at Pleasant View Orchard! Beginning about Labor Day, come to Kercher’s Sunrise Orchards and spend the day with your family picking apples! The owners and staff at Kercher’s are knowledgeable and well versed in all things apples, and are delighted to answer any questions you may have. Take a guided apple tour which includes a hay ride, one upper cute apple sipper cup filled with Kercher’s sweet and fresh apple cider, and more! And before you leave, make sure to a take picture with the cut-out apple and tell all your friends #IMADEIT2KERCHERS! Ditzler Orchard in southern Rosedale, Indiana, is a place to bring the whole family this fall. Family owned and operated since 1972, Ditzler Orchard has an example of southern Hoosier hospitality at its finest and bringing with it some of the best apples throughout the state. Ditzler Orchard is all about keeping it local, from the employees they hire to the products they buy and sell. Quiet, peaceful, and inviting are the three words to describe to Ditzler Orchard, so come on down today! Come to Lafayette, Indiana, this fall and get ready to pick some apples! The orchard is family owned and operated, and has been since the mid-1800s, and has been registered as a documented archeological site. Not only is the farm full of history and ancient artifacts, they are also full of delicious, homegrown produce and other treats! This is country apple picking at its finest! Be sure say hello to fellow farm dogs Biscuit, Doree, and Sam!